1st Floor: Grand Entry leads to Foyer and Dining Room. The 2-story Hall/Stairwell leads to the formal Living Room and Verandah. The Master?s Suite is designed for the ultimate in luxury, and also is wheelchair accessible with a roll-in shower, turn-around, and side-opening jetted tub. The Suite also has a dressing closet and private porch overlooking the swimming pool. 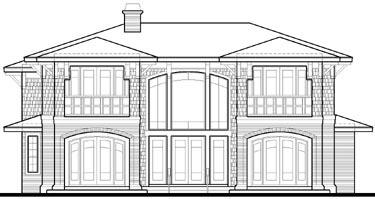 On the right side of the house is the Caterer?s Kitchen, Nook, Family room with fireplace, Porch, Laundry, Garage, and wheelchair ramp behind a decorative colonnade. 2nd Floor: The elevator and stairwell lead to the second floor Office/Lounge. This area is perfect for a second family room, or a place for your guests to relax in privacy, or conduct business. Also upstairs are three bedroom suites. Two suites feature porches overlooking the pool. Above the garage is the Guest/In-law suite, featuring bath, closet, and wet bar. The outside of the home features Arts & Crafts styling with a stone water-table, brick first level, cedar shake second level, large overhangs with decorative brackets. On the rear of the house, the double, two-story porches provide scenic outdoor viewing of the pool and gardens area.